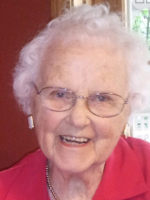 CHATHAM – Virginia Sanly Balfour “Nonnie” passed away at age 94 on Sunday, July 1, 2018. Virginia was born in Oneonta, NY where she spent her youth and teenage years. While working as a bookkeeper, she was courted by, and later married Walter Balfour in 1949. That began a wonderful life together. Walt and Virginia lived in Rochester, NY and Cazenovia, NY before they settled in Chatham in 1960. Along the way, they welcomed 3 sons who Virginia loved dearly. Virginia received the Jefferson Award for service to her community in 2005. Virginia was very active in her church, serving as secretary and choir member. She coordinated church fundraising dinners and delivered meals to shut ins. In the community, Virginia supported Rotary initiatives, volunteered at Red Cross Blood Banks, Chatham Memorial Hospital Auxiliary and Mac Hayden Theatre. Virginia’s life centered around serving others. She was always happy to help, wherever she was needed. Most important to Virginia, however, was her family and the memories they made. Virginia will be remembered by her generosity of spirit, quick wit and kindness. You could always count on her Christmas teas, lemon pies, homemade bread and endless supply of cookies. Everyone was welcomed to join for dinner at her table. There was always room for one more. Virginia will be greatly missed. She is survived by her husband Walter, her 3 sons Lynn (Janet) of Broadview Heights, Ohio, Kim (Linda) of Delanson, NY and Gary (Denise) of East Greenbush, NY. (Also by her 5 grandchildren David, Marie, Sara, Andrew and Emilie). Virginia has 6 great grandchildren Ian, Adam, Jackson, Madelyn Virginia, Michael and Fiona. She was pre-deceased by her sister Joan Cook and brother George Traver Sanly. A celebration of her life will be held on Monday, July 16 at 1:00 p.m. at Chatham United Methodist Church, 13 Kinderhook St in Chatham. An open house reception at the church will follow from 2-4 p.m. In lieu of flowers, donations may be made to Columbia Memorial Hospital Auxiliary, 71 Prospect Ave., Hudson, NY 12534; or to a charity of your choice. Virginia’s family would like to thank the staff at Columbia Memorial Hospital for their attentiveness and compassionate care for Virginia during her final hours.